This article walks you through an example integration scenario, showing how to provide blueprints for your own integration scenarios. Having completed our discussions on the blueprint details, it's now time to look at a few specific examples. This article walks you through an example integration scenario, showing how expanding the previously discussed details provides blueprints for your own integration scenarios. As mentioned before, the architectural details covered here are based on real customer integration solutions using open-source technologies. The example scenario presented here is a generic common blueprint that was uncovered researching customer solutions. It's my intent to provide a blueprint that provides guidance and not deep technical details. This section covers the visual representations as presented, but it's expected that they'll be evolving visually over time. There are many ways to represent each element in this architectural blueprint, but I've chosen icons, text, and colors that I hope are going to make it all easy to absorb. Feel free to post comments at the bottom of this post, or contact me directly with your feedback. Now let's take a look at the details in this blueprint and outline the solution. 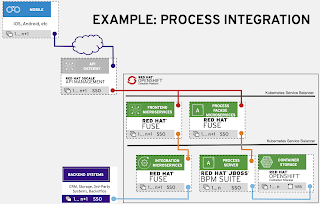 The example blueprint shown in the figure titled Example: Process Integration outlines how to integrate automation into your architecture. In this example, starting from the top, a mobile device is used to connect to your services through an API gateway. It's leveraging a group of microservices that provides front-end functionality; everything from push notifications, synchronization, to simple more complex activities that front-end applications need to service their clients. These front-end microservices are gathering data and information from the various organizational backend systems by working through integration microservices. There is a conscious effort here to keep this blueprint example as concise as possible. Therefore, the integration of various potential backend systems has been simplified to a single representative box. 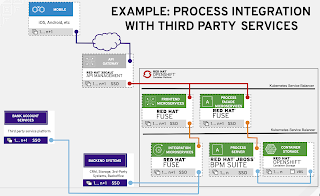 When interaction with process automation is desired, the mobile application works with process facade microservices that expose any functionality of the process server, which leverages container native storage highlighting container-based storage options featured by container platforms. As many organizations have to deal with third party legacy decisions in their architectures, it makes sense to show the versatility that open-source integration technology offers. It's easy to lean on metaphors where open standards in open-source integration solutions offer organizations the versatility of a Swiss Army knife. 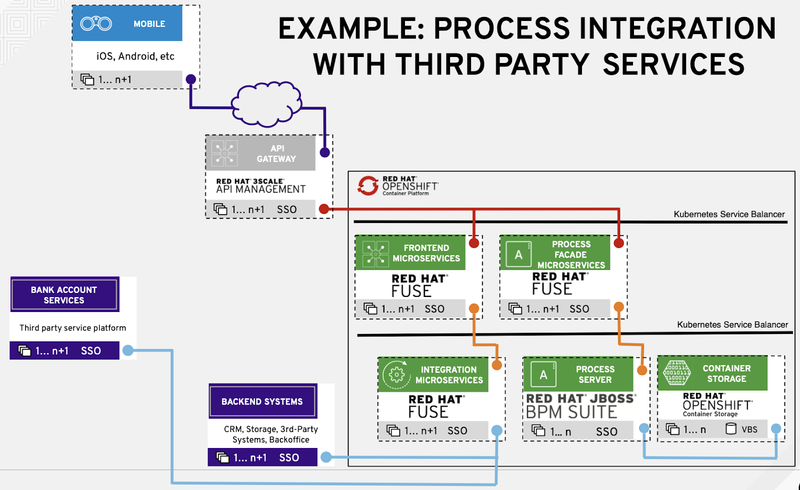 The blueprint shown in the figure titled Example: Process Integration with Third Party Services expands the original process integration use case with a third-party service platform. Without specifying this third-party service platform, it's clear that leveraging the integration microservices of an organization can establish a separation from legacy technology choices that might not be standing the test of time. This overview covers the first example architecture blueprints on process integration for omnichannel customer experience use case.